You know, those unnaturally green cocktails made with artificially flavored sour apple schnapps and vodka, garnished with a maraschino cherry? Any time I’ve tried one, I’ve always thought, “why am I not just eating a sour apple Jolly Rancher candy instead?” I didn’t set out to make a better, more natural version of this cocktail, but I think I ended up doing so. When the weather turns chilly in late September/early October, I start to crave certain flavors. Pumpkin. Winter squash. Cranberries. Brussels sprouts. Apples. I usually manage to make an apple-picking trip every year, which usually coincides with a purchase of a bottle of applejack from the liquor store. For those of you who have not tried this lovely potable, it tastes like a home-grown version of Calvados. 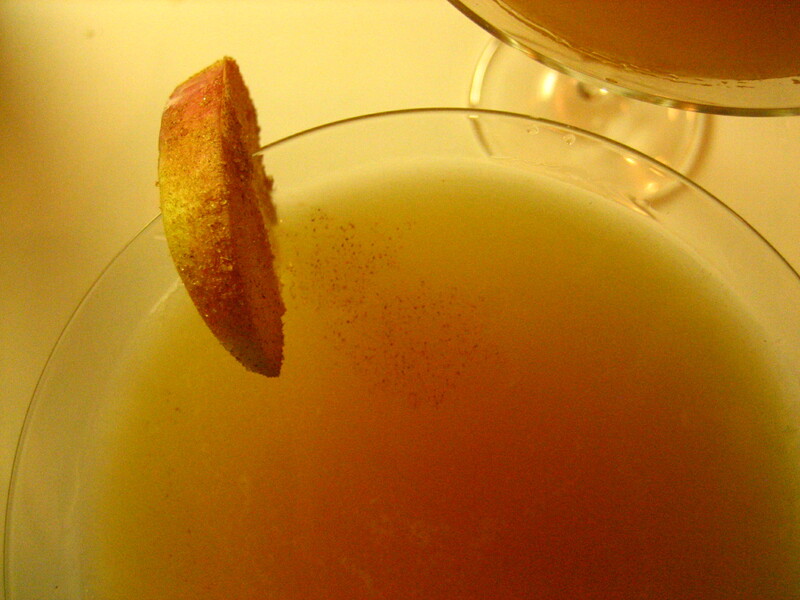 In short, it is potent, apple-y, and delicious – the love child of bourbon and apple cider. Somehow, it is also infinitely mixable, as in the Jack Rose cocktail, which is one of the staple drinks of the golden age of booze; I’ll post about that one, if anyone is interested (just let me know in the comments section). Shake vigorously until the shaker is too cold to hold and then strain into a cocktail glass. Garnish with a sliver of apple coated in cinnamon sugar. Serve immediately; try not to guzzle. This looks absolutely delicious. Wow. Gonna try it. Thanks! wooooooow!!.. un altro gioco scemo sul wii!! ne serviva priropo un altro vista l’estrema carenza.. magari saranno addirittura capaci di farci una edizione speciale con tanto di blob di pezza ( o qualunque cosa sia quella cosa che il ragazzino si porta dietro..)ma poi, perche fermarsi al pupazzetto? quando si pu benissimo inserirci anche un bel dvd con il make-up del gioco! !, 3 ore di video sulle tragiche esperienze adolescenziali degli sviluppatori, e su come abbiano fatto ad incontrarsi e a partorire un’idea cosi malsana!..dai dai, che se va tutto come non deve andare a natale ci fanno il film. Ohhh, sounds perfect for this time of the year. Yum! This looks and sounds really tasty. I wish I could try one right now! I’m going straight home and trying it this evening. That looks like the perfect cocktail for this time of year. I’m going to try that tonight, and if it goes well it may be one of drinks for this thanksgiving weekend (Canadian…). Slainte! Not a cocktail person at all, but I agree with you on the fall cravings. So way to make it work for you! 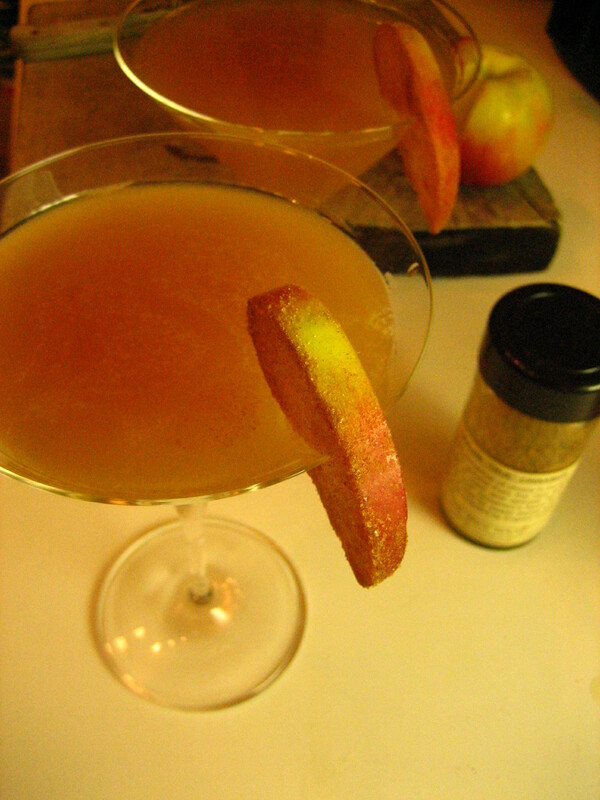 Cocktails with apples? Thank u. Simple enough for me to try. Always good to see a shift from the wretched fake ingredient cocktail to the fresh ingredient cocktail — I’ll have to try this recipe! I’m not much of a cocktail person my self, as they’re usually too sweet and too artificial for me, so this upgraded apple-tini looks like a much better option. It looks so good in the pic, it makes me wanna throw a cocktail party for my friends. I agree, this looks pretty damn delicious. I also like that you made your drink chilled, since I feel like in the Fall, we get bombarded with warm drinks. I know its not as warm as summer but its not winter yet people :-p I will definitely try this recipe. Sounds great. How drunk did you guys get on this? I might have drank enough to fall down over. Mmmm… I’m going to try this!!! sounds delish! love. this! my lush friends and I will be trying this immejiately! I have got to try this! I’ve been eating apples like a madman since the first of the month. There really is something about autumn that makes one crave them. My first drink that I tried was the Apple Martini. I think it’s time to try this one as I am sure that it will be much better! This sounds great, and I can’t wait for this weekend when I can try it. I AM a cocktail person. It makes me laugh when a friend says, “let’s go for cocktails” and then orders a beer. I’m always up for a good one… and this looks a great new one to try. Looks yummy I am going to try this weekend. Cheers! gosh! we so have to make these. my husband loves making cocktails and we’re having a house-warming this weekend. will try these out and let you know. Sounds delicious! I might try this one with friends over the weekend. Great to see natural cocktails made with fresh ingredients, the way they should be. Fantastic recipe. Thanks, Luke. I really appreciate it!